Queen Kapiolani Hotel - Wedding Venue and Packages | The Future Mrs.
With 13,046 square feet of meeting and event space, we are the perfect destination for corporate meetings and luxurious celebrations. Our Queens Room is perfect for small parties. It can accommodate 100 guests for theatre seating and 50 guests with banquet-style seating. Our Peacock Room features 12 foot ceilings and a generous space for 175 guests for theatre-style seating and up to 275 for a cocktail reception. The Akala Ballroom is our largest banquet room and can hold up to 600 people. Perfect for weddings or large parties, this beautiful space can seat 400 for a banquet-style dining. We also have outdoor space for your special occasion on the third floor pool deck and stone terrace. 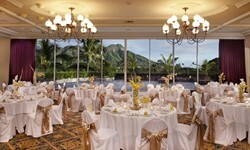 Your guests will experience spectacular views of Diamond Head and the Pacific Ocean as they celebrate in style.